Last year we fell in love with New Mexico’s White Sand Dunes, so it was a no brainer that we had to see North America’s largest sand dunes during our time spent in Southern Colorado. The drive from Black Canyon of the Gunnison to Great Sand Dunes was beautiful, especially when passing through the Curecanti National Recreation Area. We arrived to Great Sand Dunes in time for a late lunch, and with the early winter month upon us, the low sun gave us perfect lighting for photos. 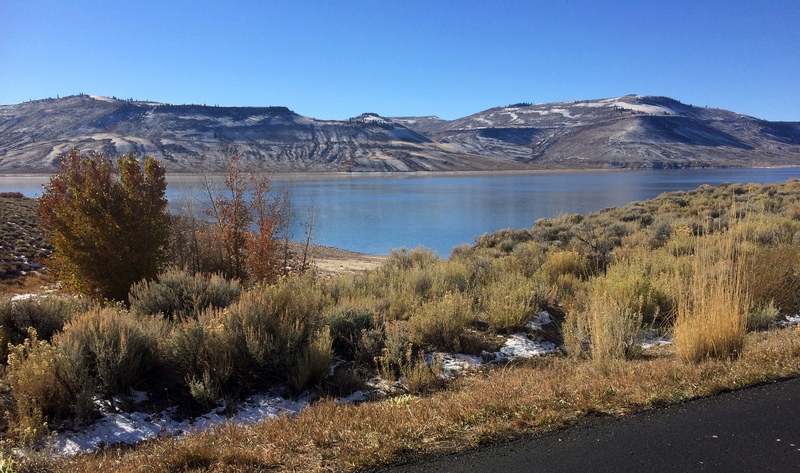 In the peak months of May and June, a seasonal creek flows through the dunes, and with a high clearance vehicle, more hiking options become available. 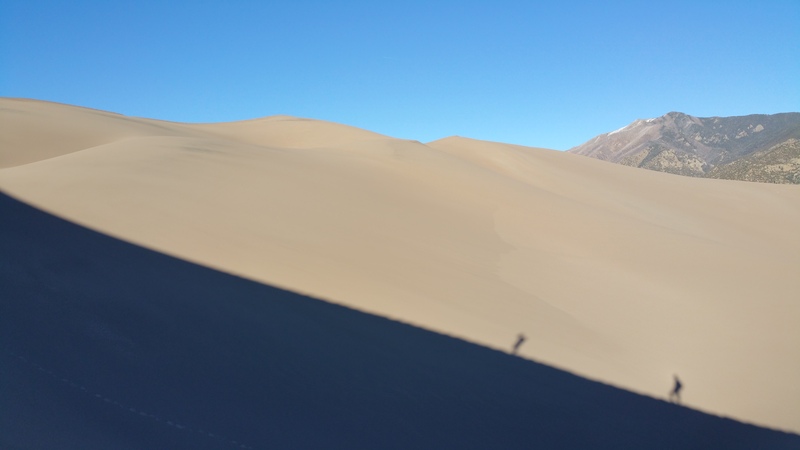 It was neither peak season, nor did we have a high clearance vehicle, but we had perfect weather and timing for a quick hike to the highest sand dune in the continent. So up we went to the 750 ft. tall High Dune. Who knew that such massive sand dunes could be backed by this lovely landscape of snow-topped alpine mountains? It was easy to forget that we were in a high-altitude desert. With the valley floor approximately 7,500 feet in elevation, I found myself huffing and puffing along the steep slopes of the dunes. It took us 45 minutes to summit, and 30 minutes to return to the parking lot for a roundtrip time of an hour and fifteen minutes. Not too shabby. We both wore gaiters (highly recommended!) so we didn’t have to fuss with uncomfortable mounds of sand accumulating in our shoes. Of the three items on our day’s checklist, we had one remaining. Leave Montrose (check! 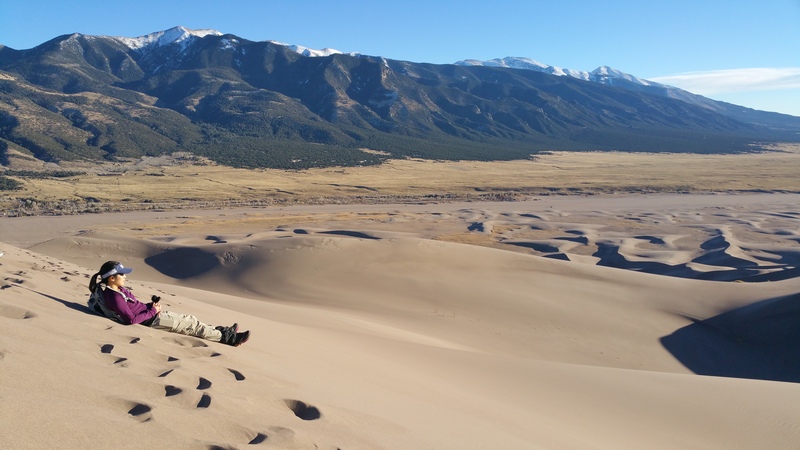 ), arrive to Great Sand Dunes and hike a dune (check! ), and find a campsite (time to go!). 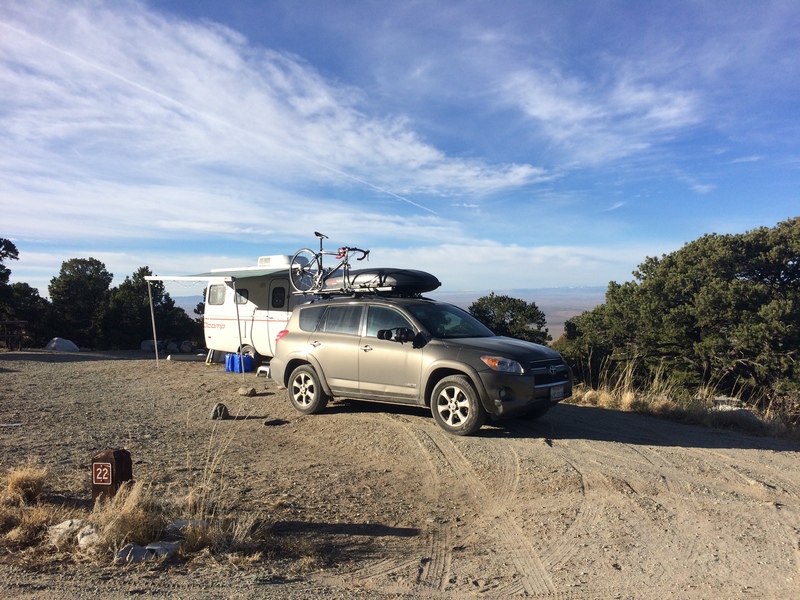 Fortunately the popular, nearby Zapata Falls Campground was only a 7-mile drive away. 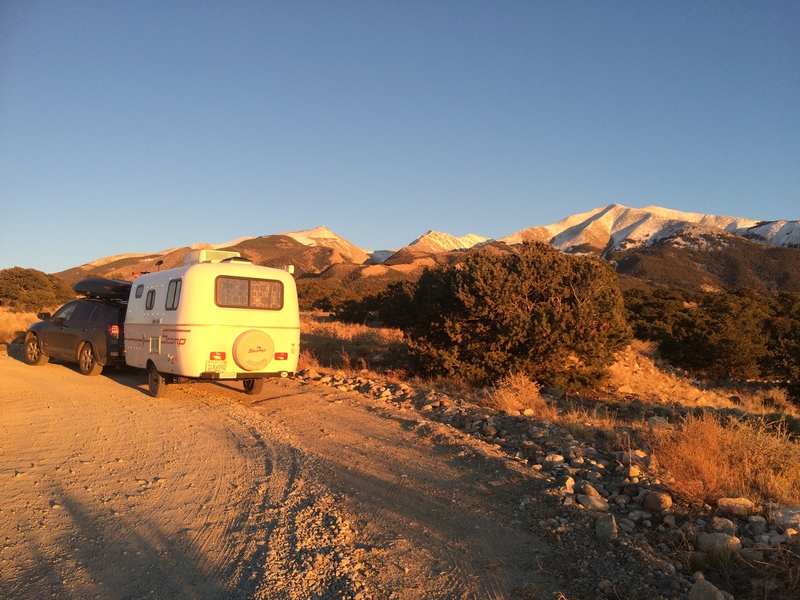 Three miles of steep washboard gravel road led us to the campground as the sun set. At $11/night the campground is a deal, especially since it boasts spectacular views of the sand dunes and has a couple of hiking trails itself. However, due to mixed messages, I thought the campground was free during the off-season. Whoops. 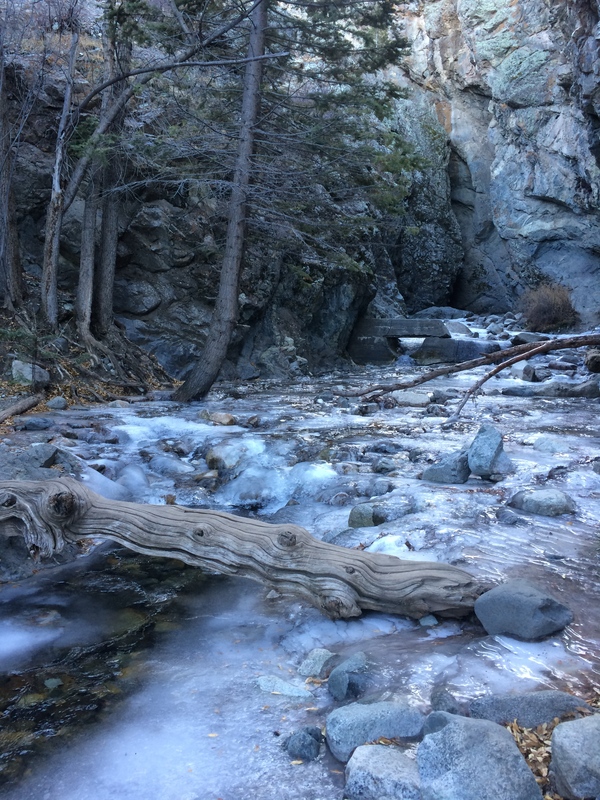 I set out that morning with two goals: to check out Zapata Falls and hike to South Zapata Lake. 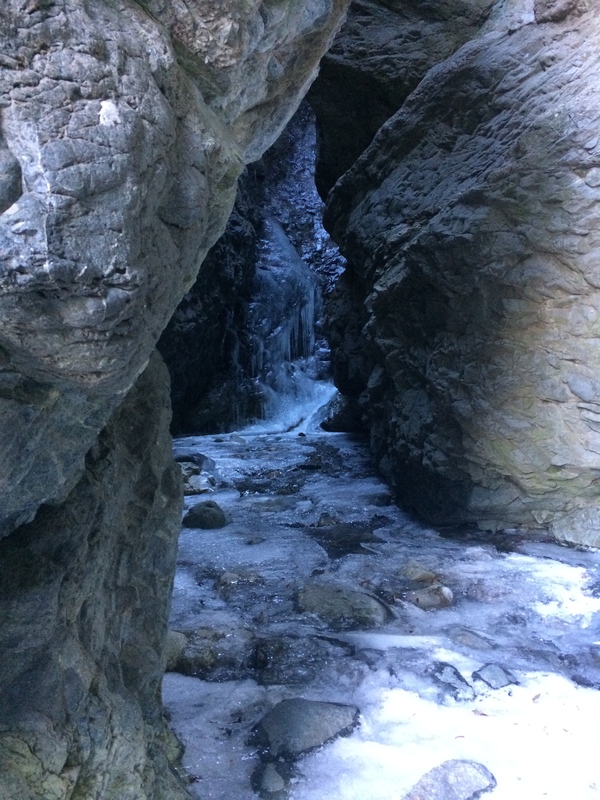 To see Zapata Falls would normally require wading through the ankle-high creek through a small cave, but at this time of year, I only hoped it was frozen enough to walk on. Upon arriving to the creek, I saw that the creek was mostly frozen. 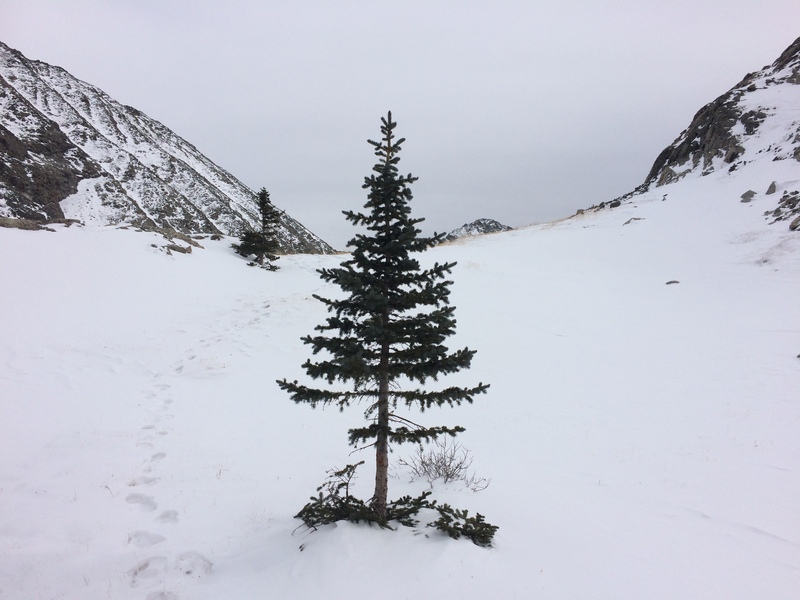 Everyone else there turned back because they did not have crampons…but I did! Even with crampons, I had to exercise extreme caution as I gingerly took steps toward the frozen falls due to thin areas of ice. 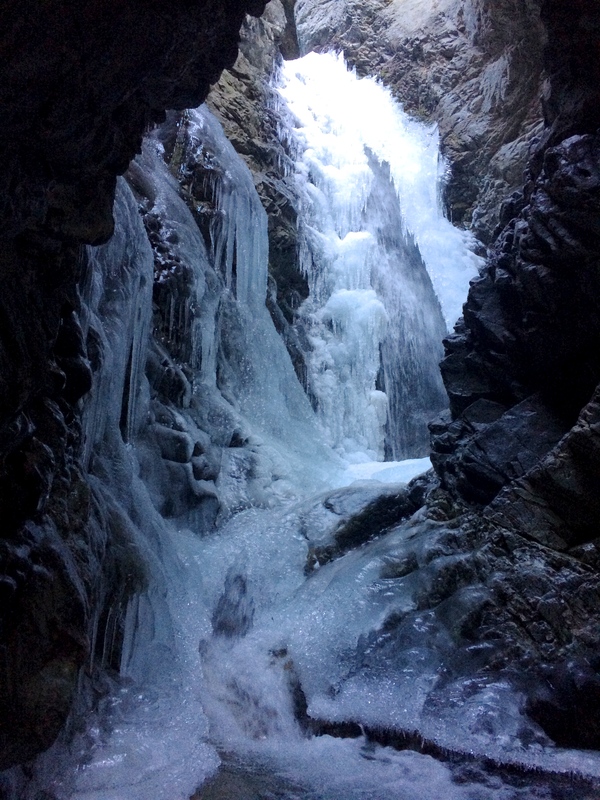 Because I was the only visitor with crampons, I was the only visitor able to see the mostly frozen falls. Hearing the roar of the falls beneath the icicles was surreal, along with seeing the bubbles gurgle under thin sections of the ice. I nimbly made my way back out to embark on my second goal for the day: hike up to South Zapata Lake. Not long after returning to the campsite, we packed up and headed out. Ideally we would have stayed another night–that was the original plan. We loved having the whole campground to ourselves, the splendid views of the valley and sand dunes below, the nearby hiking trails, and cell phone service and data! But due to a winter storm advisory in the area, we didn’t want to chance it. Steep gravel road in snow while towing? No thanks. 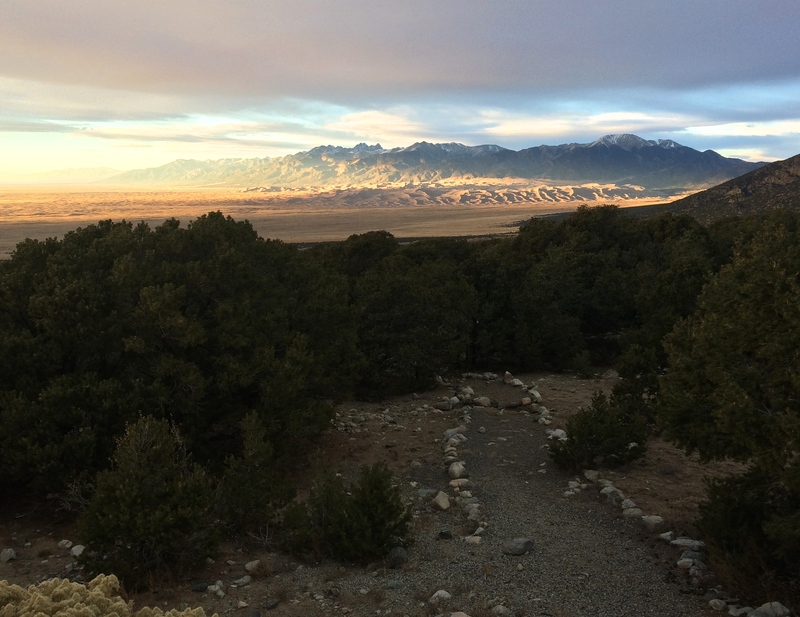 We literally made our way down the hill as the glorious alpenglow of sunset began to creep upon the great sand dunes below. Great Sand Dunes and Zapata Falls were a bit out of the way, but definitely worth it. After all, there is nowhere else in North America where we’d be able to find sand dunes of this grandeur. 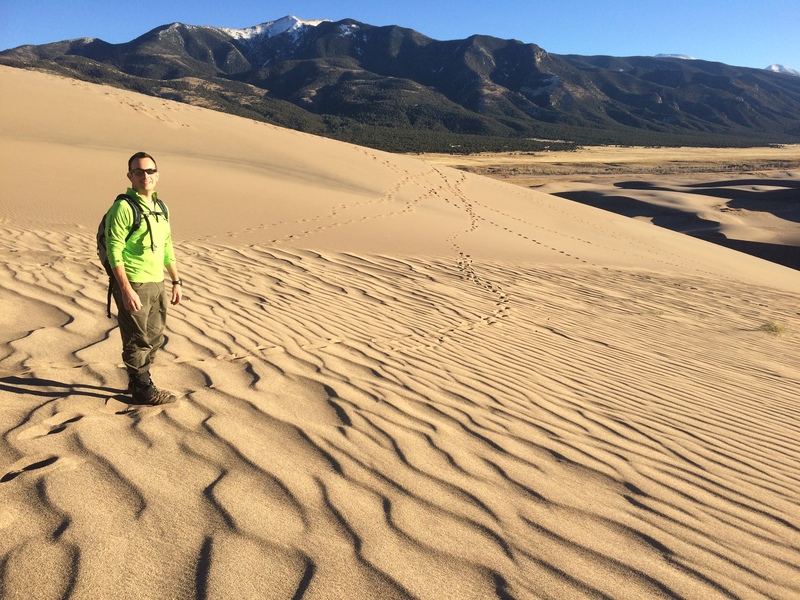 This entry was posted in Colorado and tagged great sand dunes, zapata falls. Bookmark the permalink. Go at sunrise or sunset for the best lighting!